To help you celebrate Labor Day in patriotic fashion, we are offering a special discount on kids clothing that is Made in America. Click here to shop our Fall Made in the USA styles and enter discount code CEX901 in the coupon code field at checkout to save 15% on each of these styles. Offer expires 9/1/08. Cannot be combined with any other offers or on previous purchases. Growing up in Mechanicsville, VA (a suburb right outside of Richmond), I loved playing softball and writing poetry. Unfortunately, wrist surgery put an end to the former, but I do still like to write. One year, I entered a contest, won first place and had my poem was published in a book… I am very proud of that one! I have never left the Richmond area and was working for BEST Products until they went out of business in 1996. I have been with CWDkids ever since, starting in our retail warehouse and moving on to my current position handling catalog copy proofing, website maintenance (including inventory management, sale pricing, item and image launches) and customer service email. CWDkids is a wonderful company. We are such a tight knit group… everyone knows everyone and we have fun group events like cook-outs and bowling. We have contests during holidays where we decorate our offices. We even had a Halloween party last year where we brought in our children to trick or treat. It was great to be able to bring in my son, Christian, to show him what a fun place Mom gets to go to work! Sadly, this is my last week at CWDkids… not that I want to leave, but my husband has a terrific job opportunity in Ohio, and we have decided to move away from Virginia. I will miss everyone here in our office as well as many of the customers that I have gotten to know through email. You all will be in good hands though. 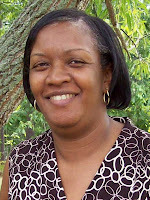 One of our current employees, Carol Marie, will be taking over and will do a great job! You will get to learn more about her in her blog post later this Fall. I love fishing (got that from my Dad), crabbing and boating. My dream vacations are Hawaii and a cruise to Alaska. I am patiently waiting for January as we are taking out son to Disney for his 5th birthday! 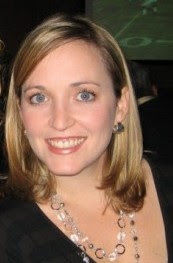 Thank you Kelley for all of your hard work and dedication over the past 12 years. We will miss hearing your laughter around the office and seeing you each day. Please stay in touch with us by commenting on the blog or emailing us. Good luck in this new exciting phase of your life! Our Junkfood Vintage Tee's are a huge hit this season! Kids love these soft screen print tee's, and mom's love the thermal long sleeves to keep arms warm during the Fall chill. In a world of good versus evil --these Star Wars Tees are great. Young Luke Skywalkers can pick their favorite tee, grab their light sabers, and roam their neighborhoods with their super powers! Also - Check out our Batman and Indiana Jones T-Shirts. For Girl's there's a glittery Hello Kitty, and a sweet Peace Now dove. We have been listening to your comments have have added more infant clothing! Take a look at these terrific outfits sizes 12M, 18M, and 24M that coordinate with some of our most popular older kids styles. "Ali (5), and Ricky, (3 1/2) loved wearing these matching outfits - they felt very tropical and loved that they matched the beautiful beach scenery." I moved from My Old Kentucky Home to Richmond VA in 1989 and first worked in the retail trenches for the marketing department of an upscale mall. After many years on the front lines, I decided it was time for me to work behind the scenes. 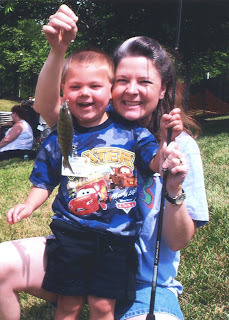 I started working for CWDkids in 1999, which could not have been better timing, because I was a new grandmother. 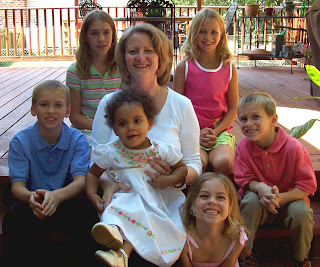 Now more than nine years later I have six awesome grandchildren. I’m sitting in grandparent heaven! Here at our corporate office, I have a multifunction position. On the administrative side I process your mail orders and merchandise returns. I manage returned checks from mail orders and stores, maintain our stores email listings, prepare bank deposits, adjust totals on offsite warehouse merchandise transfers, answer phones and assist with various other things. As office manager I maintain inventory and buy supplies for our office and three stores. I communicate property problems to appropriate vendors. In our blog introduction you heard about our resident fish, well, I give them tender loving care everyday. CWDkids has been the perfect fit as it has complimented my home life. I recently learned I will be taking on some new projects as well. Jim (the boss) gave me his fortune cookie the other day and the message was “You Love a Challenge”, hmmm…..you think that was a setup? My grandchildren give me life!! My Virginia husband of 10 years has been the most PATIENT man I’ve ever known. Coming from a humble background I appreciate all the finer things in life; my family, pets and friends. Enter code CEX828 at checkout now through 8/28/08 and save 10%. Many of our employees are moms so we realize that there are many back-to-school shopping guides out there. What we have not seen is a guide that helps you plan for all the fall and winter occasions that will be coming up. We know how busy you are so we have created the information below as a helpful reminder about what your kids clothing needs might be in the coming months. Back-to-school – It is still hot in much of the country and kids will continue to wear shorts and tees well into September. But all of a sudden a cold snap will hit; you never know when or where so order early to avoid any panic on that first cool morning. Layering is best for early in the season. Skirts and tunic dresses can be worn alone to begin with … add tights or leggings as the weather gets colder. Sweaters and sweatshirts are also a staple for the layered wardrobe. Remember to stock up on basics like twill pants, knit leggings, polo shirts, etc. as sizes and colors may not be in stock later in the season when you really need them! Click here to take a look at some of our customer favorites for fall. Halloween – October 31 seems pretty far away right now, but it will sneak up on you. Buy your costumes early so that you don’t have to fight crowds and dig through messy piles at the store closer to the spooky evening. Also, remember that kids love this holiday! Don’t miss out on Halloween tees for boys and girls to wear the entire month. Their friends will be envious when they sport pumpkins, ghosts and witches well before actual trick or treating begins. We hope that this guide helps you get a jump start on the season ahead. Let us know if you have any questions or your own suggestions to add to our list. We love hearing from you! Thanks to everyone who commented on our August 13 Giveaway post. a clothing item. 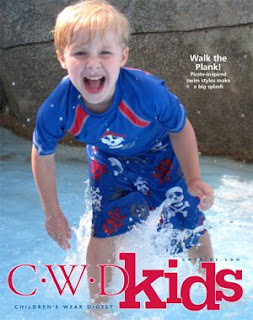 CWD Kids has a variety of styles that appeal to all my children. I have already started shopping for the fall, and am usually finished by late September. My Spring/Summer shopping will begin in late January already so the cycle goes on. I also tend to always buy extra outfits when Fall items go on sale! Please send an email to support@cwdkids.com and let us know where to send your gift certificate. To everyone who did not win this time... keep checking back as we will be having more giveaways and promotions all season long! Shop now for the last of our kids summer clothing bargains .... quantities are very low so hurry before they disappear for good! 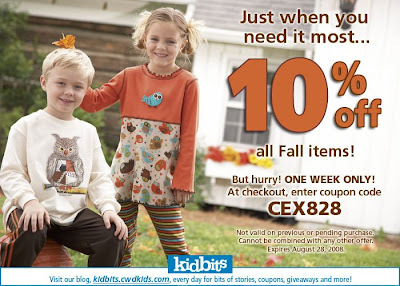 Also, if you are already shopping for Fall... check Kidbits later this week. A little birdie told me there might be a special offer code good for back-to-school shopping! "Here is my son Ethan trying to make his best pirate "ARRRGGG" face in his favorite pirate themed swim shirt & trunks from CWD Kids. I love that he's worn this swimsuit all summer & the colors are still just as bright & vivid as the day we purchased it. Thanks for the awesome quality as well as the cute styles!" Please email us at cathywdaley@cwdkids.com with your physical mailing address, and we will mail a framed copy of this catalog "cover" out to you right away! Thank you to all who entered our Photo Contest. We had such a great time looking at all of your photos and love seeing your children wearing CWDkids outfits. If you did not win the cover, keep checking back....we will periodically be posting photo entries to our Brag Book, right here on Kidbits so keep them coming! If you have a horse fanatic in your family, then CWDkids is the place to shop for your little rider! Check out our line of horse theme clothing for kids including horse dresses, horse sweaters, horse pants, jodhpurs, boots, matching brother sister outfits, and more! Our childrens horse clothing is perfect for the Fall season and Back to School fashion for kids. 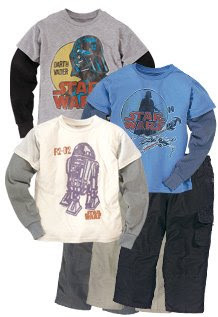 We also carry other fun themes like Halloween Clothing, Pirates, and Outer Space. Let us know what other themes/characters your children love. We are always looking for new ideas! Leave a comment on this blog post, or email us at support@cwdkids.com. I am another one of CWDkids’ long-timers! I have worked for the company since 1986. When I was originally hired, I was the receptionist, and I distinctly remember all the calls that we received after that first catalog was mailed in 1987. At that time, we were all pitching in taking orders over the phone and fulfilling shipments from our office here in Richmond, VA.
Over the years, my job duties have changed and I have had the chance to work in several different areas. Currently, I handle our damaged merchandise processing, catalog setup in our computer system, creating store merchandise tickets, and recapping sales results by item for each catalog. However, one of the best parts of my job is purchasing birthday cakes for each staff member…I think that we have at least one staff member in every month with a birthday which means we have a company party at least that often which we all love. After all, who can resist cake? Over the years, I have been able to take advantage of the discount that I get working for a kids clothing company, but unfortunately, my children, Corey and Whitley, are all grown up now. Whitley just graduated from high school in June and will be leaving for college at the end of the summer. She is my youngest and we are best buddies. I will miss going to the movies and shopping with her, but most of all, I will miss just having her around. Enjoy the time with your little ones while you can. I can tell you from experience that they grow up way too fast! I love Italian and Chinese food. The Washington Redskins are my favorite football team. I can’t wait for the season to start… Super Bowl, here we come! I have to have that one cup of coffee to get me through the morning rush. Kidbits blog readers can get a head start on shopping--We will send an email out to everyone on our list tomorrow, but you can shop at the discounted price today! 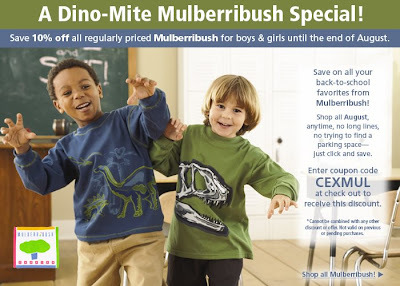 Just use Coupon Code CEXMUL at checkout and get 10% off Regular priced Mulberribush items. Hurry, this coupon expires August 31! Win a $200 Gift Certificate for Back-To-School Shopping! It's that time of year again....time to stock up on school supplies and the latest fashions to send your kids back to school in style! They may be dreading it, but maybe a few new outfits will lift their spirits? We will choose one lucky winner to receive a $200 Gift Certificate to CWDkids just by commenting on this blog post! We want to know how you shop for back-to-school clothing. Have you already started shopping? If not, when do you plan to shop? Do you make all of your purchases at once, or at different times during the year? Do you buy Fall clothing now, or wait until the weather cools? Think about our questions and leave your comments on this blog post. You have from Aug. 13 until midnight Aug. 18 EST to enter. If you would like to be entered into this contest three times, become a Fan on Facebook, and add a link to Kidbits on your blog. Winner will be announced at the top of Kidbits by 2 pm EST on Aug. 19. Photo Contest - Hurry, Time is Running Out! All of us at CWDkids work hard every day to make sure that we provide you, our valued customer, with the unique, quality children's clothing you love. We take a lot of pride in what we do and stand behind our company motto: Dressing Kids Like Kids. That's why it is so rewarding to see pictures of your smiling children in our outfits. So please, send us your photos! We will select one winner and turn their photo into a CWDkids Catalog "Cover" (it wont' be a cover on a real catalog, but we wont tell if you don't!). We will frame the image and send it back to you. 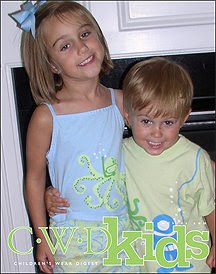 See an example (below) of a recent customer picture which has been photo shopped to look like a CWDkids catalog cover. 2. Please send only High Resolution images. 3. Tell us what you or your child(ren) love about the outfit. 4. You have from August 7 to midnight August 17 EST to submit your photos. 5. Winner will be announced Monday, August 18 at the top of this blog. If you are not selected as the winner, don't worry....we need your pictures for our "Brag Book". * We will periodically post the photos we receive. We can't wait to see them! *By emailing us your photo(s), CWDkids has permission to post them on the kidbits blog at our discretion. 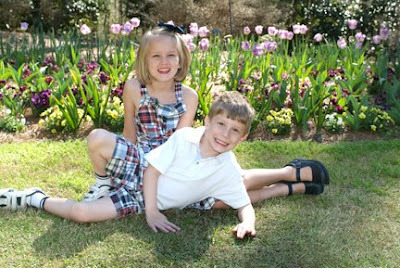 We love CWDkids customer photos....This brother sister/matching madras set looks great! "I love matching them in the madras sets...he looked handsome and she was still very girly in her dress! Thanks for carrying such great clothes!!" When I graduated from the University of Kentucky in 2002 I began working for Bella Bliss, a company that designs, manufactures and wholesales children’s sweaters, clothing and accessories. I was their first employee, at the very early stage when their corporate office was still in the basement of their house. As the inaugural employee, my job responsibilities were anything but typical. I can safely say that each day at the office was different then the day before. From shipping thousands of boxes to searching for snap tape to picking up carpool, I’ve done a little bit of everything. Then it happened--out of nowhere, I fell in love, but he lived in Richmond, VA. I figured no better time then the present, so in 2004 I was off on a new adventure. My mom and I hit the open road in a U-Haul…destination: Richmond. I found a job with a local bank, sans experience. But in October of 2006, I realized that banking was not for me (neither is wearing pantyhose every day of my life). I was ready to get back to doing something that I love. Now the hard part…finding that dream job. It must have been divine intervention because a position opened up at CWDkids on their merchandising team and I’ve been here ever since. As a part of the merchandising team I assist in the buying process from product selection to order processing. I also have the opportunity to work with our private label team to bring CWDkids Exclusive items to you. Our team is constantly researching market trends and styles to implement in our selections for our customers as well as finding new and fresh vendors, items and concepts. Although I know I still have much more to learn, I feel like my experience in the children’s fashion industry has really come full circle. These two years with CWDkids have been challenging and a lot of fun. I look forward to seeing how the company continues to grow and evolve. I celebrated my second wedding anniversary in June with the wonderful man that brought me to Richmond. In 1996 I went to my first Kentucky Derby with the owners of the horse Grindstone, who won! I was in the winner’s circle for all of the official photographs and I have a rose from the Blanket of Roses. One of the people I admire most is my Grandmother; the matriarch of our family. She has had a very fascinating life…book worthy, if you ask me. She is a very refined, passionate person with great taste and a zest for life. My favorite memories are of when she would take our family to Sea Island, Georgia every summer. A is the favorite in our house. My son loves airplanes! Email us at support@cwdkids.com with your physical mailing address and name and we will get your book, "The Planet Hue" by Corkey Hay DeSimone sent out to you right away! Thanks to everyone else who posted. We love all of your ideas for Gentle Giraffe t-shirt designs! We will be doing other giveaways and posting coupon codes throughout the Fall so please keep reading kidbits! Hurry... our flat rate shipping code is only good through 8/13. 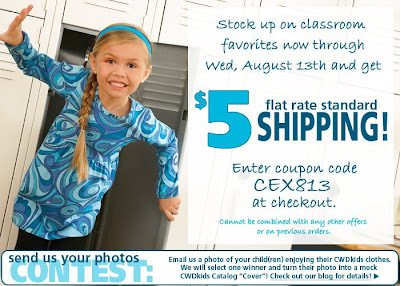 Make note of coupon code CEX813 so you can enter it at checkout and shop CWDkids.com now! Standard shipping only. Cannot be combined with any other promotions. We know that it is still very hot across most of the country and many of you may be worried about purchasing cold weather clothes now.... those little ones tend to sprout up when you least expect it. Don't worry! CWDkids has a very lenient return policy. We are happy to issue a refund or exchange an item for you for any reason within 12 months (yes, a full year) of the original shipment date. So if your kids don't want to try your back-to-school purchases on now, let them wait! If something does not work when they are ready to wear it, simply send the items back to us and we will take care of sending you a new size or credit you back the full purchase amount. Simple! PS - Before you make a purchase, please check our copy for any sizing issues. We will note if we feel an item runs small or large and will suggest you order accordingly. We are also in the process of adding actual product specs to our site to make ordering the correct size even easier! Watch for this new feature soon! 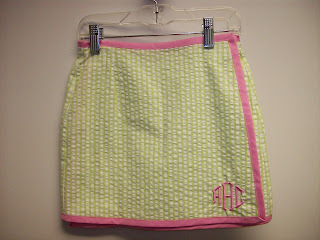 Does your daughter or another girl (size 6) that you know have the initials ACH? If so, then do we have the deal for you! If you would like more information about the items, click here to view the product info at our website, CWDkids.com! Looking for a great deal on summer items to finish out the season? 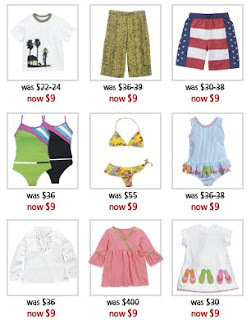 Check out these 9 terrific items for only $9 each! Hurry though... quantities are limited! Fall merchandise has been added as well so you can shop early for back-to-school and Halloween.... they will both be here before you can blink an eye! 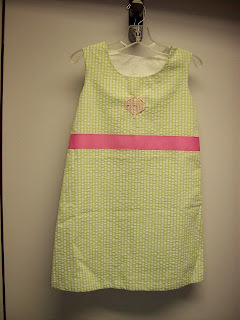 Vendor Profile - Anita G.
Anita Goodall was inspired to start a children's line when her niece, Erin was born in 1989. Anita wanted to provide reasonably priced quality garments to the children’s wear market. She specializes in making comfortable clothes including dresses, tunics, tee's, and swimwear for kids that are simple in style and easy for moms to take care of. Anita G. is known for her exclusive, unique prints in bright, fun colors. Her durable clothes let kids go from school to play. Kids can be kids in Anita’s styles. Because Anita loves kids, she donates a portion of her proceeds to a number of charities that help children. Some of these are: Feed the Children, K.I.D.S. (Kids in Distressed Situations), ARDA (The Armenian Relief and Development), The Step by Step Foundation, and orphanages in Mexico and Europe. All of us at CWDkids are huge fans of Anita G. and based on customer feedback we know that you love her too! Her easy to wear, fun styles are popular all year round for summer play or going back to school in fashion. Check out CWDkids line of Anita G. clothing here. Then help us decide which patterns we should offer next and be entered to win The Planet Hue, a book by Corkey Hay DeSimone, the graphic designer at Gentle Giraffe. Click here to read more about her! Take a look at the patterns we are trying to choose from and read the rules to be entered below. 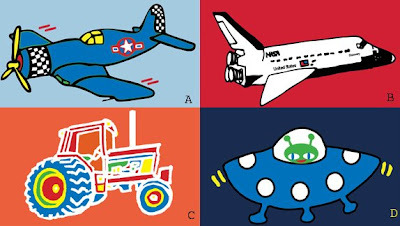 Comment on this post by Wednesday August 6 and let us know which of the prints above (A,B,C or D) is your favorite. To be entered a second time, you can post again and tell us what other themes you would like to see! Winner will be posted here on Thursday August 7 and will have until Friday August 15 to email us at support@cwdkids.com to collect their prize. Because we have such a small office, there is really no “working your way up the ladder” I have simply been allowed to grow as the company grows. When I first started, my job was primarily our catalog circulation. Over the years, I have added many other responsibilities to the list, the biggest of which is overseeing our website, cwdkids.com. I am currently the VP – Marketing & Operations which allows me to be involved in many different projects on a regular basis. Having a master’s degree in Art History, who would have guessed that I would end up working in e-commerce? I was living in Washington, DC and in addition to having realized that the museum world was not for me, I had decided that the traffic and commuting was too much (and that was 11 years ago!). The question was where to move? Richmond seemed to be the perfect middle ground between the small city that I had grown up in and DC. But what would I do? I started networking and had a couple of job interviews in the art field when I was introduced to the Klaus family and CWDkids. I set up what I thought was just an informational interview with our President, Jim Klaus. At the end of our discussion, he informed me that they wanted to hire someone to help with marketing (at that point, he had been doing it all himself). After some serious consideration, I decided to give it a shot and discovered that it was a great fit for me. I really enjoy all aspects of my job from working with our printer and paper contacts to learning more than I ever thought that I would know about websites, servers, and e-commerce technology. However, as many others on our staff have already mentioned, the best part is the office itself. 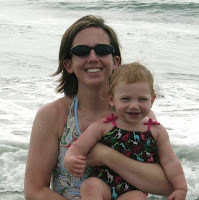 Having had my first child in 2007 (pictured with me above on our annual beach trip), I appreciate the fact that our small family-run business is so flexible even more than I did prior to her birth. It is nice to know that your employer cares not only about you, but about your work-life balance. I plan on sticking around for many more years to come and hope that you will continue to shop with CWDkids too! I am training to run my first marathon this November… I figure if I put it in writing on this blog, I will actually have to run it! I enjoy golf. After several years at it, I realize that I am not Tiger Woods (shocking, huh?) Once in a while I may break 100, but finally realize that the point is to have fun! I have no desire to move north of Virginia… the winters here are plenty cold for me!